But those I bought yesterday were Smith & Wesson's. Boring but more interesting because that bill came to $400,000. The one's I bought today were very nice. EMF by Piettta 1873 SAA. I bought a bunch of the plain Jane versions. Those will sell very well at the price I will advertise them at. And then a few of the nicer models. And then I bought a few that were just too cool to pass up. They had one with American flag grips but I passed on them but this next one really tripped my trigger so I bought a few. It has an octagon barrel and the engraving is really nice for being done by a laser. They also had a hand engraved model but that was out of my price range. They are nicer and cheaper than a Ruger Vaquero so I think they will do really well. Actually the nice engraved model is cheaper than a Vaquero in the most basic form. 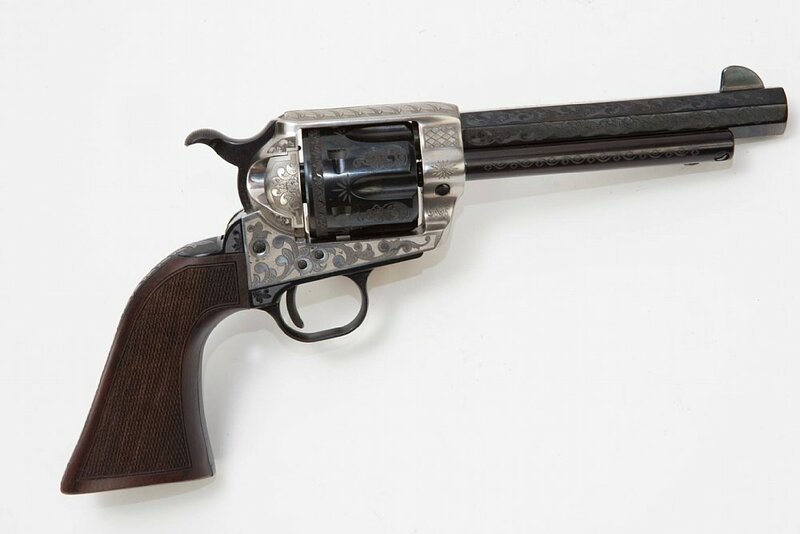 And they are real 1873 clones with the firing pin in the hammer so they look like a Colt. Actually they felt nicer than the most recent Colt SAA I had my hands on. I am hoping for a home run on these. I do like that top one. I like .45LC. Every one of those look nice. Those look like they have a MAP at my LGS. I like the case hardened versions. A case hardened with octagon barrel and no engraving would be what I like. The case hardened ones with the white grips and in .357 would be sweet. I'm not much for .45LC, but pairing it with a case hardened receiver Henry Big Boy, and that would be a nice set. I like the last one best as I'm not into white grips. On the other hand the base model with the brass frame and walnut grips would pair nicely with a Henry big Boy. All that being said when it came down to actually buying one, I would buy the Ruger. I have such an abiding faith in Ruger revolvers that I would pay the extra amount. So, how much will the first one cost? Asking for a friend. $450 is the lowest I can advertise them for but I will likely do an unadvertised special at $350. The fancy one at the bottom will be less than $700 which is not far off of a Vaquero. we bought a few of those last one you posted. They look real nice if you laquer stick the engraving on the barrel. I went to EMF headquarters in Commiefornia back in '77 and bought a bunch of stuff. Do they still market the SA's as "Dakota"? Over the years I have had several, and I still have a Sheriff's model .45LC with short barrel and no ejector. If you can't spring for a Colt, and you don't want a transfer bar gun like the Rugers, these are a great option. Oooooh, Cowboy guns, I likie cowboy guns. Those are some pretty ones too. Pietta makes some nice ones too. When I was going through my cowboy action phase, they were top on my list of ones to buy. I ended up with the Ruger though, actually the special issue anniversary issue Blackhawks which honestly was based on the anniversary thing and the modern feature like sights and indexing cylinder but hands down the Pietta's were a lot prettier, more western looking and they do have a solid reputation. Fun times with those. The'll look great in a nice cowboy belt/holster. 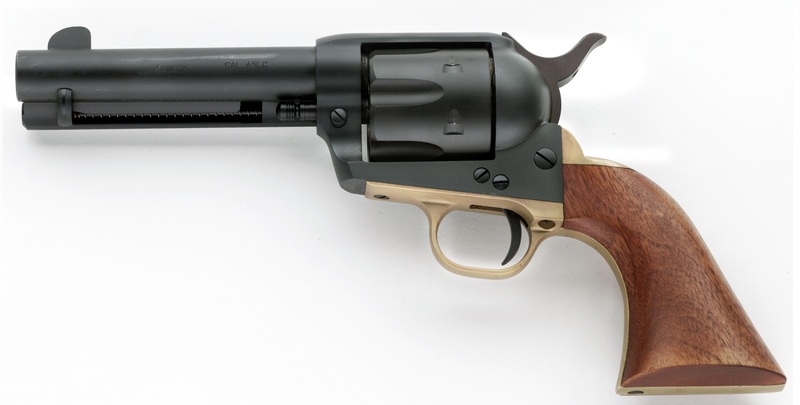 BTW, Just as funny adder, whenever one of my high speed low drag buddies goes off on his 2 second conceal draw of his semi, I whip out one of those old babies and slap a cowboy holster and show them a cowboy draw. To someone who has never done it before, its like "Damn" and I'm not even fast. If I was in the Wild West, I'd be dead. And you know how that is. You want a do-over. If I was closer to you, one of them would go home with me.